The other day my heart nearly stopped. I’m not usually scared of spiders, but this one was a huge spider (for round here anyway) – it was easily 7 – 10cm in diameter (including legs), and it moved very fast too. The spider unnerved me as it was on the wall next to my bed when I first saw it. I did not fancy my chances of not having a heart attack, should it decide to use any part of my body as terrain while I slept, so I decided to remove it from my flat. I had no intention of killing it, so I captured it by putting a container over it, while placing a post card underneath. I found an empty sugar jar and was able to photograph it before taking it outside and releasing it in the woods. 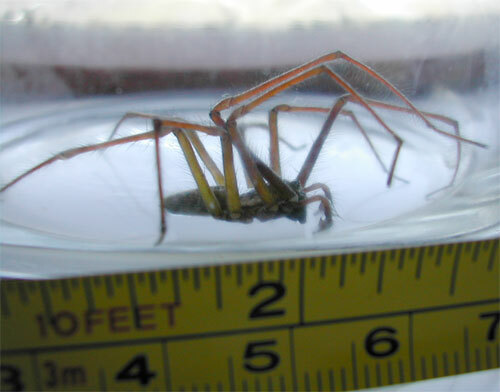 No doubt people in other countries will think it laughable that a three inch spider is such an unusual sight, but here in the UK it’s not so common indoors (apart from the Daddy Longlegs). The spider’s legs by the way are not yellow or green – they are reflecting the yellow of the tape measure in the photo. Large spiders fascinate me. I’m sure small spiders would too, but we can see the anatomy much better on larger ones, so I can never resist photographing interesting looking spiders. 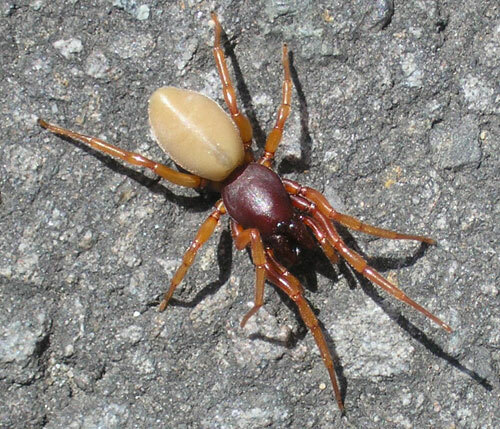 Here is another spider I saw a few weeks ago. It was smaller in total size, but had a larger body than the one that wanted to live with me. It was approximately 4cm long (including legs). I haven’t been able to find out what type of spider either one is. But if anyone knows I’d love to hear from you. Just click on the speech bubble at the top to leave a comment, thanks. Ever used Dragon Naturally Speaking for dictating your muses and turning them into text? I wondered how well it would take to singing, after it spewed out some gobbledegook after I started singing, forgetting I still had my mike on. Answer: not very well. Well that’s not entirely fair. It seems to like mod and new-wave better than warbling ballads. Or rather; words, as opposed to noises! Not bad. I probably did sing ‘Chew’ in the haste of the song. Here in my car I feel safest of all, I can lock all my doors. It’s the only way to live in cars – da da da da. “Da da da da” sounds like “been good and”? Well it got the first eight words correct! Perhaps I overdid it when trying to sing the synth part. Does that mean people who live alone win arguments easily? “Ryanair is a fair submarine”, eh? – better tell them they’re in the wrong business. Yes, I realize I’m giving my age away with these songs – I’ll throw Lilly Allen into the Dragon mix next time. That’ll be nice for her. 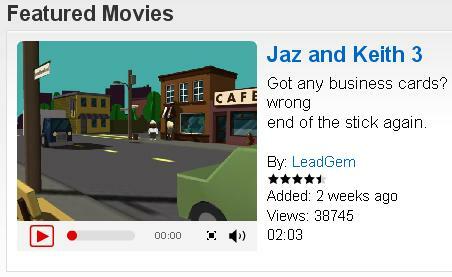 Which of the animated gifs above do you like best? I like the spirals best. Actually, that is the only right answer. Not because I insist you agree with me, but because it is the only animated gif * out of the two. The other is a still image. What? You think it’s moving? Had a little drink, have we? 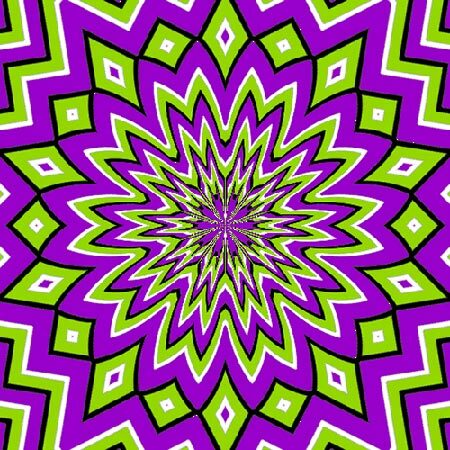 The optical illusion works by using specific colors with black edges and white edges in relation to each other, and is known as anomalous motion illusion. Still don’t believe me? OK, look right in the center. It should stop moving. It didn’t with me because I can’t keep my dyslexic eyes still, but it did slow it down a lot! So now you might be able to stagger home without falling. * prounced GIF, not JIF – (that drives me crazy!) – It’s short for Graphics Interchange Format. You wouldn’t say “Giraffics Interchange Format”, would you? OK, maybe you would. The NHS is planning to improve working conditions for workers in an attempt to reduce the epidemic of sickness rates among staff. Read more Here. They’re wasting their time. I used to work for the NHS and when doctors insist on wearing stethoscopes round their necks, while in the canteen eating their lunch, it’s clear that sickness goes very deep. Do they not have access to bags, pockets or lockers? Does wearing a stethoscope make the doctor’s food taste better? Do they think the chef might need a checkup? (OK so it was a teaching hospital, with newly qualified doctors, but alas, it was not only the newbies that wore the stethoscopes). Are they so insecure that they feel they have to stand out from the riffraff? It wasn’t everyone, of course. In fact a lot of surgeons found it as funny as I did that so many doctors felt the need to do this. 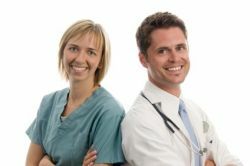 I wondered if perhaps surgeons were immune from this affliction, being known as Mister or Mrs, instead of Doctor! No wonder the staff are taking sickies in their droves. When the disease of self importance (read self loathing) spreads throughout a hospital, it can only create more stress among staff, due to abuse of power. Stethoscopes are comfort blankets for these poor souls and it could well be the stricken patients who are the healthiest creatures in the place. I am intrigued by the Google Street View Camera. It sits on top of a large van or a VW Beetle and roams round the streets of the earth snapping everything in it’s path in a 360 degree fashion. 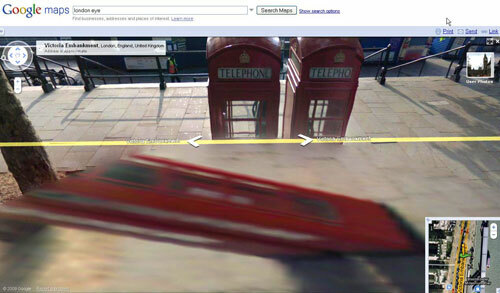 Then the images from the 11-lens camera are stitched together (sometimes not very well – see telephone box on the right missing two letters) to enable users to move around their street (or the street of the person they are stalking) from inside an invisible sphere. I have never seen the camera-ed up vehicle, but then, would I really want to? 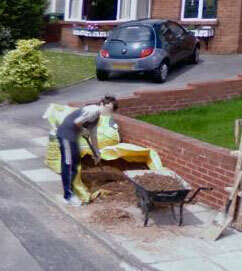 I have seen the result of having people in the vicinity when Street View Cam is on the loose, and it’s not nice. One of two things happen. This happened to someone I don’t know. But I found him when browsing the streets of… I’m not going to tell you where. And I’m not going to report the image to Google either. Whenever people have noted interesting finds on Google Maps Street View, it has promptly been removed. But lets see how long it takes them to find this one with no location information whatsoever. I have blanked out this guy’s face for his own protection (although I don’t know him, I’m guessing the original is not the most flattering photo of him). They leave his face intact but blank out the plate of the car behind him. Go figure. Even stranger; his hip and parts of the brick wall have been blurred. The other thing that intrigues me is the distorted Bermuda Circle that appears at the bottom of the images that makes cars look like they’ve been chopped up and put back together by an abstract artist who hates cars. It’s not nice to witness that your car has suffered this fate, but London phone boxes don’t seem to have any objections. * (in the case of recognizable individuals, you can ‘Report a Problem’ to Google and they will remove or blur the image). Someone asked me why Michael Jackson wore tape on his fingers and I wasn’t sure, so I did a search online. 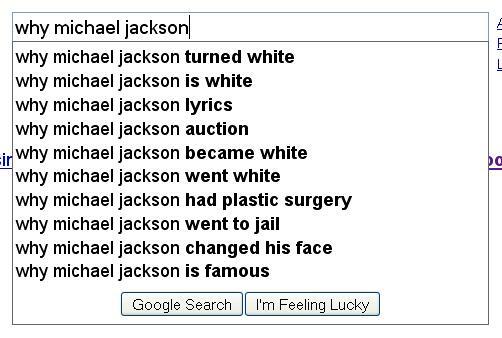 As I typed in “Why Michael Jackson” Google very helpfully finished my sentence, by using the most popular searches beginning with the same words. 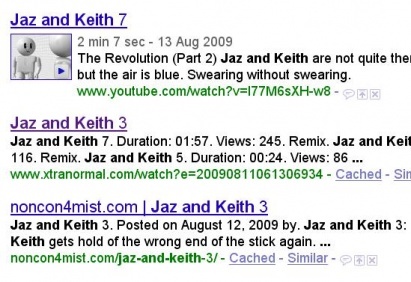 And being about Michael Jackson, we’re talking hundreds of thousands of searches, possibly millions. So I was rather surprised to see the phrase “Why Michael Jackson is famous” in the drop down menu, but it seems a substantial number of people didn’t know who he was (I’m guessing) until he died. I never found a definitive answer to why he wore tape on his fingers, although vitiligo and his burn accident were reputed to be possible initial causes. And apparently, he liked the image so he kept it. And who was going to argue with him? 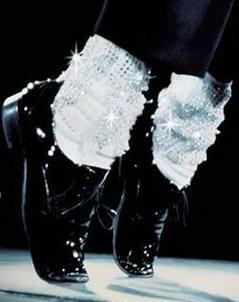 He was the only person in the world who could get away with wearing trousers that were too short, but then most of us don’t wear Swarovski crystals on our socks.